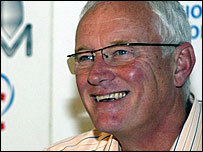 Leyton Orient owner Barry Hearn says he is confident they can agree a deal to move into the Olympic Stadium in Stratford after the 2012 Games. The venue's future after the Games is unclear but the track must be retained. "I wouldn't say a deal's imminent but I believe we're front-runners for eventual occupation," Hearn told BBC Radio 5 Live. "There's a problem with the stadium's future and we're saying, subject to terms, we could be interested." A London Olympic Delivery Authority spokesperson confirmed to BBC Sport that the organisation is engaged in exploratory talks with a host of football and rugby clubs, including Orient. In a statement, the LODA added: "Our discussions are continuing with rugby and lower league football clubs and we are happy with how these legacy discussions are progressing," it said. "It is important to remember that we are still six years away from the legacy phase of the stadium but the fact we are talking about these issues today demonstrates the thorough planning going on now." Hearn admits that the League One leaders have the advantage of not facing much competition for the venue. "Frankly, who else is there?" he said. "We've got to look at design issues as we've got to look at an athletics track which is definitely going to be there - that's a non-negotiable part of the International Olympic Committee pledge. "So we've got to live with it or have a design like the Stade de France perhaps, where it's covered with replaceable seats. "I'm not a technical expert, but as a football fan, I don't like stadiums with a track. "But people cleverer than me have enough input to make the problem disappear - if both parties want it to disappear, I imagine it can be removed." Hearn said it was important that the stadium was used to maximum effect for the local community, and his club was in pole position. "The Olympics is the best thing ever to happen to the East End of London, a huge amount of money being spent, but what is the legacy? "The stadium is not going away so it will have to be used for sport and particularly the local community, of which Leyton Orient has been a part for my lifetime. "We have the ambition to move and our negotiations over the next few weeks and months, I am sure, will bring a deal to fruition. "We're an ambitious little club who, because we have the best squad we've had in light years, suddenly find ourselves on top of League One and the ambition burns a little brighter. "To be based at the Olympic Stadium is a great postal address, and if we were there with the finance from developing our existing ground, then perhaps we can look at that little light at the end of the tunnel and say 'maybe, just maybe, we can go somewhere'."